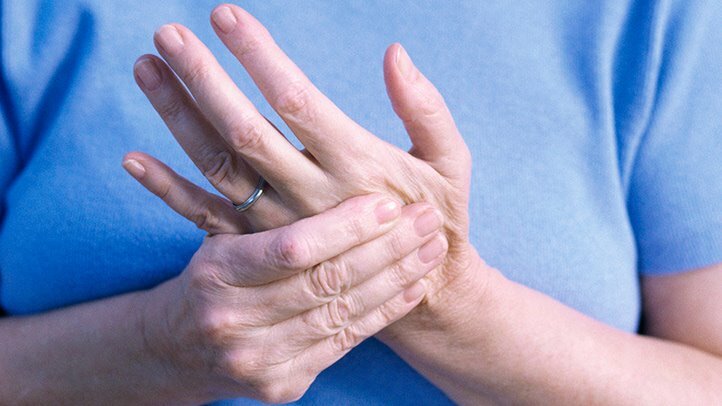 If you’re taking your rheumatoid arthritis medication as directed but still feel aches and pains, try making these simple changes to help you feel better. “There’s evidence that people who smoke have a higher risk of developing rheumatoid arthritis and possibly even a more severe form of rheumatoid arthritis,” says Harry Fischer, MD, an associate professor of medicine at the Icahn School of Medicine and chief of rheumatology at Mount Sinai Beth Israel Hospital in New York City. For instance, a large study published in the journal Arthritis Research and Therapy in 2013 concluded that even light smoking raised the risk for RA in women. The researchers also found that quitting smoking could reduce the risk. “If you’ve been diagnosed with rheumatoid arthritis, stop smoking,” Dr. Fischer says. There’s no specific diet for rheumatoid arthritis, but certain foods seem to contribute to inflammation, according to the Arthritis Foundation. Avoiding or limiting inflammatory foods and replacing them with plenty of anti-inflammatory foods is especially beneficial for people with RA, says Rachel Begun, MS, RDN, a special diets expert and culinary nutritionist in Boulder, Colorado. Foods that contribute to inflammation include fatty cuts of meat and whole-milk products, packaged foods with hydrogenated and partially hydrogenated oils, and foods with refined flours, empty starches, and added sugars, she says. Instead, load your plate with foods rich in omega-3 fatty acids, like wild salmon, anchovies, or walnuts, Begun says. Choose antioxidant-rich fruits, vegetables, and whole grains, and use olive oil, avocado, nuts, and nut butters, which contain healthy monounsaturated fats. “Ginger and turmeric are two spices known for their anti-inflammatory benefits, so using them to flavor dishes is both a beneficial and delicious idea,” she says. Excess weight isn’t good for people with rheumatoid arthritis, Fischer says, because it adds extra stress and strain on weight-bearing joints like the knees and hips. Being overweight can contribute to other health problems that may affect RA too, he says. If you have joint pain, the last thing you may want to do is exercise — but don’t skip it. Doing low-impact aerobic exercise, such as walking or swimming, can help keep weight off and reduce joint pain and other symptoms of rheumatoid arthritis. “There’s probably no adverse effect of alcohol consumption for rheumatoid arthritis,” Fischer says. But booze can interfere with some medications for RA, he says, so ask your doctor if you can safely drink alcohol. If you choose to drink, don’t overdo it. That means no more than one drink a day for women and two for men, according to the U.S. Centers for Disease Control and Prevention. Vitamin D — the sunshine vitamin — is needed to build strong bones, joints, and cartilage. Not getting enough vitamin D may contribute to muscle and skeletal pain in people with rheumatoid arthritis, Fischer says. A study published in the journalTherapeutic Advances in Endocrinology and Metabolism in 2012 found that vitamin D deficiency may be linked to more severe disease activity in people with RA. If you’re low on vitamin D, supplements may help with pain and prevent osteoporosis, according to the study. Sunlight stimulates vitamin D production, so soak up some sun for 10 to 15 minutes every other day. To get vitamin D through your diet, include such foods as sardines, fortified milk and yogurts, and egg yolks, Begun says. Sometimes rheumatoid arthritis improves during pregnancy, possibly because of hormonal changes, Fischer says. But if you’re pregnant or are planning to have a child, it’s important to talk with your doctor first. Some medications for RA, including methotrexate, can cause serious birth defects and need to be stopped months before conception, according to the American College of Rheumatology. If you can predict the weather based on your joint pain, you’re not alone. Temperature drops and falling barometric pressure are linked to more joint pain. You can’t change the weather, but you can be well-prepared. The Arthritis Foundation’s joint pain forecast can let you know what to expect.